Freeman John Dyson FRS (born 15 December 1923) is a British-American theoretical physicist and mathematician. He is known for his work in quantum electrodynamics, solid-state physics, astronomy and nuclear engineering. He theorized several concepts that bear his name, such as Dyson's transform, Dyson tree, Dyson series, and Dyson sphere. He is the son of George Dyson. He is professor emeritus in the Institute for Advanced Study in Princeton, a Visitor of Ralston College, and a member of the Board of Sponsors of the Bulletin of the Atomic Scientists. Born on 15 December 1923, at Crowthorne in Berkshire, Dyson is the son of the English composer George Dyson, who was later knighted. His mother had a law degree, and after Dyson was born she worked as a social worker. Although not known to be related to the early 20th-century astronomer Frank Watson Dyson, as a small boy Dyson was aware of him and has credited the popularity of an astronomer sharing his surname with helping to spark his own interest in science. At the age of five he calculated the number of atoms in the sun. As a child, he showed an interest in large numbers and in the solar system, and was strongly influenced by the book Men of Mathematics by Eric Temple Bell. Politically, Dyson says he was "brought up as a socialist". On G. I. Taylor's advice and recommendation, Dyson moved to the United States in 1947 as a Commonwealth Fellow to earn a physics doctorate with Hans Bethe at Cornell University (1947–48). Within a week, however, he had made the acquaintance of Richard Feynman. The budding English physicist recognized the brilliance of the flamboyant American, and attached himself as quickly as possible. He then moved to the Institute for Advanced Study (1948–49), before returning to England (1949–51), where he was a research fellow at the University of Birmingham. Dyson never got his PhD degree. In 1949, Dyson demonstrated the equivalence of two then-current formulations of quantum electrodynamics (QED): Richard Feynman's diagrams and the operator method developed by Julian Schwinger and Shin'ichirō Tomonaga. He was the first person after their creator to appreciate the power of Feynman diagrams, and his paper written in 1948 and published in 1949 was the first to make use of them. He said in that paper that Feynman diagrams were not just a computational tool, but a physical theory, and developed rules for the diagrams that completely solved the renormalization problem. Dyson's paper and also his lectures presented Feynman's theories of QED in a form that other physicists could understand, facilitating the physics community's acceptance of Feynman's work. J. Robert Oppenheimer, in particular, was persuaded by Dyson that Feynman's new theory was as valid as Schwinger's and Tomonaga's. Oppenheimer rewarded Dyson with a lifetime appointment at the Institute for Advanced Study, "for proving me wrong", in Oppenheimer's words. Also in 1949, in related work, Dyson invented the Dyson series. It was this paper that inspired John Ward to derive his celebrated Ward identity. In 1951, Dyson joined the faculty at Cornell as a physics professor, although still lacking a doctorate, and in 1953, he received a permanent post at the Institute for Advanced Study in Princeton, New Jersey, where he has now lived for more than sixty years. In 1957, he became a naturalized citizen of the United States and renounced his British nationality. One reason he gave decades later is that his children born in the United States had not been recognized as British subjects. From 1957 to 1961, he worked on Project Orion, which proposed the possibility of space-flight using nuclear pulse propulsion. A prototype was demonstrated using conventional explosives, but the 1963 Partial Test Ban Treaty, in which Dyson was involved and supported, permitted only underground nuclear weapons testing, so the project was abandoned. In 1958, he led the design team for the TRIGA, a small, inherently safe nuclear reactor used throughout the world in hospitals and universities for the production of medical isotopes. A seminal paper by Dyson came in 1966, when, together with Andrew Lenard and independently of Elliott H. Lieb and Walter Thirring, he proved rigorously that the exclusion principle plays the main role in the stability of bulk matter. Hence, it is not the electromagnetic repulsion between outer-shell orbital electrons which prevents two wood blocks that are left on top of each other from coalescing into a single piece, but rather it is the exclusion principle applied to electrons and protons that generates the classical macroscopic normal force. In condensed matter physics, Dyson also analysed the phase transition of the Ising model in 1 dimension and spin waves. Dyson also did work in a variety of topics in mathematics, such as topology, analysis, number theory and random matrices. There is an interesting story involving random matrices. In 1973, the number theorist Hugh Montgomery was visiting the Institute for Advanced Study and had just made his pair correlation conjecture concerning the distribution of the zeros of the Riemann zeta function. He showed his formula to the mathematician Atle Selberg, who said it looked like something in mathematical physics and he should show it to Dyson, which he did. Dyson recognized the formula as the pair correlation function of the Gaussian unitary ensemble, which has been extensively studied by physicists. This suggested that there might be an unexpected connection between the distribution of primes (2, 3, 5, 7, 11, ...) and the energy levels in the nuclei of heavy elements such as uranium. Around 1979, Dyson worked with the Institute for Energy Analysis on climate studies. This group, under the direction of Alvin Weinberg, pioneered multidisciplinary climate studies, including a strong biology group. Also during the 1970s, he worked on climate studies conducted by the JASON defense advisory group. Dyson retired from the Institute for Advanced Study in 1994. In 1998 he joined the board of the Solar Electric Light Fund. As of 2003[update] he was president of the Space Studies Institute, the space research organization founded by Gerard K. O'Neill; As of 2013[update] he is on its Board of Trustees. Dyson is a longtime member of the JASON group. Dyson has won numerous scientific awards but never a Nobel Prize. Nobel physics laureate Steven Weinberg has said that the Nobel committee has "fleeced" Dyson, but Dyson himself remarked in 2009, "I think it's almost true without exception if you want to win a Nobel Prize, you should have a long attention span, get hold of some deep and important problem and stay with it for ten years. That wasn't my style." Dyson is a regular contributor to The New York Review of Books. In 2012, he published (with William H. Press) a fundamental new result about the Prisoner's Dilemma in PNAS. With his first wife, the Swiss mathematician Verena Huber-Dyson, Dyson had two children, Esther and George. In 1958, he married Imme Jung, a masters runner, and they had four more children, Dorothy, Mia, Rebecca, and Emily Dyson. Dyson's eldest daughter, Esther, is a digital technology consultant and investor; she has been called "the most influential woman in all the computer world." His son, George, is a historian of science, one of whose books is Project Orion: The Atomic Spaceship 1957–1965. My book The Sun, the Genome, and the Internet (1999) describes a vision of green technology enriching villages all over the world and halting the migration from villages to megacities. The three components of the vision are all essential: the sun to provide energy where it is needed, the genome to provide plants that can convert sunlight into chemical fuels cheaply and efficiently, the Internet to end the intellectual and economic isolation of rural populations. With all three components in place, every village in Africa could enjoy its fair share of the blessings of civilization. Dyson cheerfully admits his record as a prophet is mixed, but "it is better to be wrong than to be vague." "To answer the world's material needs, technology has to be not only beautiful but also cheap." Dyson favors the dual origin concept: Life first formed cells, then enzymes, and finally, much later, genes. This was first propounded by the Russian Alexander Oparin. J. B. S. Haldane developed the same theory independently. Dyson has simplified things by saying simply that life evolved in two stages, widely separated in time. He regards it as too unlikely that genes could have developed fully blown in one process, because of the biochemistry. Current cells contain adenosine triphosphate or ATP and adenosine 5'-monophosphate or AMP, which greatly resemble each other but have completely different functions. ATP transports energy around the cell, and AMP is part of RNA and the genetic apparatus. Dyson proposes that in a primitive early cell containing ATP and AMP, RNA and replication were invented accidentally because of the similarity between AMP and RNA. He suggests that AMP was produced when ATP molecules lost two of their phosphate radicals, and then one cell somewhere performed Eigen's experiment and produced RNA. Unfortunately there is no direct evidence for the dual origin concept, because once genes developed, they took over, obliterating all traces of the earlier forms of life. In the first origin, the cells were probably just drops of water held together by surface tension, teeming with enzymes and chemical reactions, and a primitive kind of growth or replication. When the liquid drop became too big, it split into two drops. Many complex molecules formed in these "little city economies" and the probability that genes would eventually develop in them was much greater than in the prebiotic environment. Artist's concept of Dyson rings, forming a stable Dyson swarm, or "Dyson sphere"
One should expect that, within a few thousand years of its entering the stage of industrial development, any intelligent species should be found occupying an artificial biosphere which completely surrounds its parent star. In 1960, Dyson wrote a short paper for the journal Science, titled "Search for Artificial Stellar Sources of Infrared Radiation". In it, he theorized that a technologically advanced extraterrestrial civilization might completely surround its native star with artificial structures in order to maximize the capture of the star's available energy. Eventually, the civilization would completely enclose the star, intercepting electromagnetic radiation with wavelengths from visible light downwards and radiating waste heat outwards as infrared radiation. Therefore, one method of searching for extraterrestrial civilizations would be to look for large objects radiating in the infrared range of the electromagnetic spectrum. Dyson conceived that such structures would be clouds of asteroid-sized space habitats, though science fiction writers have preferred a solid structure: either way, such an artifact is often called a Dyson sphere, although Dyson used the term "shell". Dyson says that he used the term "artificial biosphere" in the article to mean a habitat, not a shape. The general concept of such an energy-transferring shell had been advanced decades earlier by author Olaf Stapledon in his 1937 novel Star Maker, a source Dyson has credited publicly. Dyson has also proposed the creation of a Dyson tree, a genetically engineered plant capable of growing on a comet. He suggested that comets could be engineered to contain hollow spaces filled with a breathable atmosphere, thus providing self-sustaining habitats for humanity in the outer Solar System. Plants could grow greenhouses ... just as turtles grow shells and polar bears grow fur and polyps build coral reefs in tropical seas. These plants could keep warm by the light from a distant Sun and conserve the oxygen that they produce by photosynthesis. The greenhouse would consist of a thick skin providing thermal insulation, with small transparent windows to admit sunlight. Outside the skin would be an array of simple lenses, focusing sunlight through the windows into the interior ... Groups of greenhouses could grow together to form extended habitats for other species of plants and animals. I've done some historical research on the costs of the Mayflower's voyage, and on the Mormons' emigration to Utah, and I think it's possible to go into space on a much smaller scale. A cost on the order of $40,000 per person [1978 dollars, $143,254 in 2013 dollars] would be the target to shoot for; in terms of real wages, that would make it comparable to the colonization of America. Unless it's brought down to that level it's not really interesting to me, because otherwise it would be a luxury that only governments could afford. The problem is, of course, that they can't afford to fail. The rules of the game are that you don't take a chance, because if you fail, then probably your whole program gets wiped out. He still hopes for cheap space travel, but is resigned to waiting for private entrepreneurs to develop something new and inexpensive. No law of physics or biology forbids cheap travel and settlement all over the solar system and beyond. But it is impossible to predict how long this will take. Predictions of the dates of future achievements are notoriously fallible. My guess is that the era of cheap unmanned missions will be the next fifty years, and the era of cheap manned missions will start sometime late in the twenty-first century. Any affordable program of manned exploration must be centered in biology, and its time frame tied to the time frame of biotechnology; a hundred years, roughly the time it will take us to learn to grow warm-blooded plants, is probably reasonable. Dyson also proposed the use of bioengineered space colonies to colonize the Kuiper Belt on the outer edge of our Solar System. He proposed that habitats could be grown from space hardened spores. The colonies could then be warmed by large reflector plant leaves that could focus the dim, distant sunlight back on the growing colony. This was illustrated by Pat Rawlings on the cover of the National Space Society's Ad Astra magazine. A direct search for life in Europa's ocean would today be prohibitively expensive. Impacts on Europa give us an easier way to look for evidence of life there. Every time a major impact occurs on Europa, a vast quantity of water is splashed from the ocean into the space around Jupiter. Some of the water evaporates, and some condenses into snow. Creatures living in the water far enough from the impact have a chance of being splashed intact into space and quickly freeze-dried. Therefore, an easy way to look for evidence of life in Europa's ocean is to look for freeze-dried fish in the ring of space debris orbiting Jupiter. Freeze-dried fish orbiting Jupiter is a fanciful notion, but nature in the biological realm has a tendency to be fanciful. Nature is usually more imaginative than we are. ... To have the best chance of success, we should keep our eyes open for all possibilities. Dyson has proposed that intelligent beings may be capable of thinking an infinite number of thoughts in an open/expanding universe. Dyson also has some credits in pure mathematics. His concept "Dyson's transform" led to one of the most important lemmas of Olivier Ramaré's theorem: that every even integer can be written as a sum of no more than six primes. an entity of basic importance in the mathematical formulation of quantum mechanics, are also named after Dyson. Dyson and Hugh Montgomery discovered together an intriguing connection between quantum physics and Montgomery's pair correlation conjecture about the zeros of the Zeta function. The primes 2, 3, 5, 7, 11, 13, 17, 19, ... are described by the Riemann Zeta function, and Dyson had previously developed a description of quantum physics based on m by m arrays of totally random numbers. What Montgomery and Dyson discovered is that the eigenvalues of these matrices are spaced apart in exactly the same manner as Montgomery conjectured for the nontrivial zeros of the Zeta function. Andrew Odlyzko has verified the conjecture on a computer, using his Odlyzko–Schönhage algorithm to calculate many zeros. Dyson recognized this connection because of a number-theory question Montgomery asked him. Dyson had published results in number theory in 1947, while a Fellow at Trinity College, Cambridge and so was able to understand Montgomery's question. If Montgomery had not been visiting the Institute for Advanced Study that week, this connection might not have been discovered. There are in nature one, two, and three dimensional quasicrystals. Mathematicians define a quasicrystal as a set of discrete points whose Fourier transform is also a set of discrete points. Odlyzko has done extensive computations of the Fourier transform of the nontrivial zeros of the Zeta function, and they seem to form a one-dimensional quasicrystal. This would in fact follow from the Riemann hypothesis. What has happened in the past 10 years is that the discrepancies between what's observed and what's predicted have become much stronger. It's clear now the models are wrong, but it wasn't so clear 10 years ago. He is among signatories of a letter to the UN criticizing the Intergovernmental Panel on Climate Change (IPCC), and has also argued against ostracizing scientists whose views depart from the acknowledged mainstream of scientific opinion on climate change, stating that "heretics" have historically been an important force in driving scientific progress. "[H]eretics who question the dogmas are needed ... I am proud to be a heretic. The world always needs heretics to challenge the prevailing orthodoxies." Dyson's views on global warming have been strongly criticized. In reply, he notes that "[m]y objections to the global warming propaganda are not so much over the technical facts, about which I do not know much, but it's rather against the way those people behave and the kind of intolerance to criticism that a lot of them have." In 2008, he endorsed the now common usage of "global warming" as synonymous with global anthropogenic climate change, referring to "measurements that transformed global warming from a vague theoretical speculation into a precise observational science." I'm not saying the warming doesn't cause problems; obviously it does. Obviously we should be trying to understand it. I'm saying that the problems are being grossly exaggerated. They take away money and attention from other problems that are much more urgent and important. Poverty, infectious diseases, public education and public health. Not to mention the preservation of living creatures on land and in the oceans. The good news is that the main effect of carbon dioxide ... is to make the planet greener, [by] feeding the growth of green plants of all kinds [and] increasing the fertility of farms and fields and forests." Since originally taking interest in climate studies in the 1970s, Dyson has suggested that carbon dioxide levels in the atmosphere could be controlled by planting fast-growing trees. He calculates that it would take a trillion trees to remove all carbon from the atmosphere. In a 2014 interview, he said, "What I'm convinced of is that we don't understand climate ... It will take a lot of very hard work before that question is settled." He is a member of the academic advisory council of the Global Warming Policy Foundation, a climate sceptic think tank chaired by Nigel Lawson. At the British Bomber Command, Dyson and colleagues proposed removing two gun turrets from the RAF Lancaster bombers, to cut the catastrophic losses due to German fighters in the Battle of Berlin. A Lancaster without turrets could fly 50 mph (80 km/h) faster and be much more maneuverable. All our advice to the commander in chief [went] through the chief of our section, who was a career civil servant. His guiding principle was to tell the commander in chief things that the commander in chief liked to hear ... To push the idea of ripping out gun turrets, against the official mythology of the gallant gunner defending his crew mates ... was not the kind of suggestion the commander in chief liked to hear. I agreed emphatically with Henry Stimson. Once we had got ourselves into the business of bombing cities, we might as well do the job competently and get it over with. I felt better that morning than I had felt for years ... Those fellows who had built the atomic bombs obviously knew their stuff ... Later, much later, I would remember [the downside]. I am convinced that to avoid nuclear war it is not sufficient to be afraid of it. It is necessary to be afraid, but it is equally necessary to understand. And the first step in understanding is to recognize that the problem of nuclear war is basically not technical but human and historical. If we are to avoid destruction we must first of all understand the human and historical context out of which destruction arises. Dyson opposed the Vietnam War, the Gulf War and the invasion of Iraq. He supported Barack Obama in the 2008 US presidential election and The New York Times has described him as a political liberal. He was one of 29 leading US scientists who wrote Obama a strongly supportive letter about his administration's 2015 nuclear deal with Iran. Dyson is a nondenominational Christian and has attended various churches, from Presbyterian to Roman Catholic. Regarding doctrinal or Christological issues, he has said, "I am neither a saint nor a theologian. To me, good works are more important than theology." Trouble arises when either science or religion claims universal jurisdiction, when either religious or scientific dogma claims to be infallible. Religious creationists and scientific materialists are equally dogmatic and insensitive. By their arrogance they bring both science and religion into disrepute. The media exaggerate their numbers and importance. The media rarely mention the fact that the great majority of religious people belong to moderate denominations that treat science with respect, or the fact that the great majority of scientists treat religion with respect so long as religion does not claim jurisdiction over scientific questions. Dyson partially disagrees with the famous remark by his fellow physicist Steven Weinberg that "With or without religion, good people can behave well and bad people can do evil; but for good people to do evil—that takes religion." Weinberg's statement is true as far as it goes, but it is not the whole truth. To make it the whole truth, we must add an additional clause: "And for bad people to do good things—that [also] takes religion." The main point of Christianity is that it is a religion for sinners. Jesus made that very clear. When the Pharisees asked his disciples, "Why eateth your Master with publicans and sinners?" he said, "I come to call not the righteous but sinners to repentance." Only a small fraction of sinners repent and do good things but only a small fraction of good people are led by their religion to do bad things. I am myself a Christian, a member of a community that preserves an ancient heritage of great literature and great music, provides help and counsel to young and old when they are in trouble, educates children in moral responsibility, and worships God in its own fashion. But I find Polkinghorne's theology altogether too narrow for my taste. I have no use for a theology that claims to know the answers to deep questions but bases its arguments on the beliefs of a single tribe. I am a practicing Christian but not a believing Christian. To me, to worship God means to recognize that mind and intelligence are woven into the fabric of our universe in a way that altogether surpasses our comprehension. In The God Delusion (2006), biologist Richard Dawkins criticized Dyson for accepting the religious Templeton Prize in 2000; "It would be taken as an endorsement of religion by one of the world's most distinguished physicists." In 2000 Dyson declared that he is a (non-denominational) Christian, and he has disagreed with Dawkins on several occasions, as when he criticized Dawkins' understanding of evolution. Dyson was elected a Fellow of the Royal Society (FRS) in 1952. Dyson was awarded the Lorentz Medal in 1966, Max Planck Medal in 1969, the J. Robert Oppenheimer Memorial Prize in 1970, and the Harvey Prize in 1977. In the 1984–85 academic year, he gave the Gifford lectures at Aberdeen, which resulted in the book Infinite In All Directions. In 1989, Dyson taught at Duke University as a Fritz London Memorial Lecturer. In the same year, he was elected as an Honorary Fellow of Trinity College, University of Cambridge. Dyson has published a number of collections of speculations and observations about technology, science, and the future. In 1996, he was awarded the Lewis Thomas Prize for Writing about Science. In 1993, Dyson was given the Enrico Fermi Award. In 1995, he gave the Jerusalem-Harvard Lectures at the Hebrew University of Jerusalem, sponsored jointly by the Hebrew University and Harvard University Press that grew into the book Imagined Worlds. In 2000, Dyson was awarded the Templeton Prize for Progress in Religion. In 2003, Dyson was awarded the Telluride Tech Festival Award of Technology in Telluride, Colorado. In 2011, Dyson received as one of twenty distinguished Old Wykehamists at the Ad Portas celebration, the highest honor that Winchester College bestows. In 2018, Dyson received the first Presidential Science and Humanism Award from the American University of Beirut. Selected Papers of Freeman Dyson, (Selected Works up to 1990) American Mathematical Society, 1996. Birds and Frogs: Selected Papers, 1990–2014, World Scientific Publishing Company, 2015. Dreams of Earth and Sky. New York Review Books. 2015. ISBN 9781590178546. Maker of Patterns: an Autobiography Through Letters, Liveright/W.W. Norton, 2018. ^ "Obituary of Verena Huber-Dyson". Moles Farewell Tributes. 12 March 2016. Retrieved 3 December 2017. ^ a b "Professor Freeman Dyson FRS". London: Royal Society. Archived from the original on 2015-11-16. ^ a b c Lin, Thomas (2014-03-31). "At 90, Freeman Dyson Ponders His Next Challenge". Wired. Retrieved 2014-04-02. ^ a b "Scientist wins $1m religion prize". BBC News. 9 May 2000. Retrieved 2010-05-02. ^ a b Dyson, F.J. (1979). Disturbing the Universe, p. 131, "I had finally become an American ... The decision to abjure my allegiance to Queen Elizabeth might have been a difficult one, but the Queen's ministers made it easy for me." ^ "Ralston College". Retrieved 30 January 2016. ^ Board of Sponsors. Bulletin of the Atomic Scientists. Retrieved 3 December 2017. ^ Greatest Mysteries of the Cold War: America's Interplanetary Spaceship (Project Orion) (Video). BBC Four. ^ Ghodsee, Kristen (2015). The Left Side of History: World War II and the Unfulfilled Promise of Communism in Eastern Europe. Durham, NC: Duke University Press. p. 5. ISBN 978-0-822-35823-7. ^ a b Dyson, Freeman (1 November 2006). "A Failure of Intelligence". MIT Technology Review Magazine. MIT Technology Review. Retrieved 20 October 2013. Prominent physicist Freeman Dyson recalls the time he spent developing analytical methods to help the British Royal Air Force bomb German targets during World War II. ^ "Freeman Dyson". Institute for Advanced Study, School of Natural Sciences. Princeton University. Retrieved 15 April 2014. ^ "The Approximation to Algebraic Numbers by Rationals," Acta Mathematica (Uppsala), 89, 1947, pp. 225–240. ^ "On Simultaneous Diophantine Approximations," Proceedings of the London Mathematical Society, Series 2, 49, 1947, pp. 409–420. ^ a b c d e f g h Dawidoff, Nicholas (25 March 2009). "The Civil Heretic". The New York Times Magazine. ^ Freeman Dyson (17 December 1986). "Freeman Dyson". Oral History Interviews (Interview). Interviewed by Finn Aaserud. Princeton, New Jersey: American Institute of Physics. ^ Schweber, Silvan S. (1994). QED and the Men Who Made It. Princeton, NJ: Princeton University Press. pp. 392ff. ^ "Freeman Dyson: A 'Rebel' Without a Ph.D". Quanta Magazine. 11 June 2015. Event at 1:17. Retrieved 20 January 2016. ^ "Freeman Dyson". The American Institute of Physics. Archived from the original on 17 October 2013. Retrieved 23 August 2013. ^ F. J. Dyson (1949). "The radiation theories of Tomonaga, Schwinger, and Feynman". Phys. Rev. 75 (3): 486–502. Bibcode:1949PhRv...75..486D. doi:10.1103/PhysRev.75.486. ^ Dyson, Freeman J. (1979). Disturbing the Universe. Basic Books. ISBN 978-0-465-01677-8. ^ F. J. Dyson (1949). "The S matrix in quantum electrodynamics". Phys. Rev. 75 (11): 1736–1755. Bibcode:1949PhRv...75.1736D. doi:10.1103/PhysRev.75.1736. ^ F. J. Dyson, A. Lenard (1967). "Stability of Matter. I". J. Math. Phys. 8 (3): 423–434. Bibcode:1967JMP.....8..423D. doi:10.1063/1.1705209. ^ F. J. Dyson, A. Lenard (1968). "Stability of Matter. II". J. Math. Phys. 9 (5): 698–711. Bibcode:1968JMP.....9..698L. doi:10.1063/1.1664631. ^ E. H. Lieb, W. Thirring (1975). "Bound for the Kinetic Energy of Fermions Which Proves the Stability of Matter". Phys. Rev. Lett. 35 (11): 687–689. Bibcode:1975PhRvL..35..687L. doi:10.1103/PhysRevLett.35.687. ^ a b F. J. Dyson, E. H. Lieb, Selected papers by Freeman Dyson, AMS (1996). ^ John Derbyshire, Prime Obsession, 2004, ISBN 0309085497. ^ "InterViews Freeman Dyson". National Academy of Sciences. 23 July 2004. Archived from the original on 1 December 2017. Retrieved 19 December 2011. ^ "Officers and Board". Space Studies Institute. Retrieved 6 January 2013. ^ McKelvey, Tara (27 May 2014). "Esther Dyson: Breaking through tech's glass ceiling". BBC. Retrieved 11 February 2017. ^ Dyson, F. (19 July 2007) "Our Biotech Future", New York Review of Books. Retrieved on 2011-10-07. ^ Dyson, Freeman J. (3 June 1960). "Search for Artificial Stellar Sources of Infrared Radiation". Science. 131 (3414): 1667–1668. Bibcode:1960Sci...131.1667D. doi:10.1126/science.131.3414.1667. PMID 17780673. ^ Dyson, Freeman (1 June 2011). Living Through Four Revolutions (Speech). Perimeter Institute Public Lecture Series. Waterloo, Ontario, Canada. ^ Dyson, F.J. (1979). Disturbing the Universe, p. 211, "Some science fiction writers have wrongly given me the credit of inventing the artificial biosphere. In fact, I took the idea from Olaf Stapledon, one of their own colleagues"
^ Freeman J. Dyson, "Time without end: Physics and biology in an open universe," Reviews of Modern Physics, Vol. 51, Issue 3 (July 1979), pp. 447-460; doi:10.1103/RevModPhys.51.447. ^ Dyson, Freeman J. (1962). "A Brownian?Motion Model for the Eigenvalues of a Random Matrix". J. Math. Phys. 3 (6): 1191. Bibcode:1962JMP.....3.1191D. doi:10.1063/1.1703862. ^ N/A (16 December 2007). "Wiggles". Open Mind. Archived from the original on 17 December 2009. ^ Dyson, F. (12 June 2008) "The Question of Global Warming", The New York Review of Books. Retrieved on 2011-10-07. ^ "University of Michigan 2005 Winter Commencement Address". University of Michigan. Archived from the original on 31 August 2006. ^ Dyson, Freeman (3 Dec 2015). "Misunderstandings, questionable beliefs mar Paris climate talks". Boston Globe. Retrieved 7 December 2015. ^ "Academic Advisory Council". The Global Warming Policy Foundation (GWPF). Retrieved 2017-01-19. ^ Dyson, F.J. (1979). "The Ethics of Defense" in Disturbing the Universe, p. 149. ^ Broad, William J. (8 August 2015). "29 U.S. Scientists Praise Iran Nuclear Deal in Letter to Obama". The New York Times. Retrieved 9 August 2015. ^ a b c Freeman Dyson (15 March 2000). Progress In Religion (Speech). Templeton Prize Lecture. Retrieved 2011-10-07 – via Edge.org. ^ a b Freeman Dyson (22 June 2006). "Religion from the Outside". The New York Review of Books. Retrieved 2011-10-07. ^ Moses Gbenu (June 2003). Back to Hell. Xulon Press. p. 110. ISBN 9781591608158. Retrieved 15 February 2014. The cash part of this award is over $1 million. Three facts are significant about this award. First, the same award was given to an agnostic Mathematician Freeman Dyson, the Buddhist Dalai Lama, Mother Theresa, and Charles R. Filmore, son of the founder of the mind-science cult, Unity. ^ Karl Giberson; Donald A. Yerxa (2002). Species of Origins: America's Search for a Creation Story. Rowman & Littlefield. p. 141. ISBN 9780742507654. Retrieved 15 February 2014. Dyson is not a hard-nosed materialist and, in fact, criticizes his colleagues who champion that viewpoint. Officially, he calls himself an agnostic, but his writings make it clear that his agnosticism is tinged with something akin to deism. ^ Freeman Dyson (28 March 2002). "Science & Religion: No Ends in Sight". The New York Review of Books. Retrieved 30 July 2012. ^ Dawkins, Richard (2006). The God Delusion. Bantam Press. p. 152. ISBN 978-0-61868-000-9. ^ John Brockman (2007). "Richard Dawkins—Freeman Dyson: an exchange". Edge.org. Retrieved 21 October 2015. ^ "Theoreticians Name Dyson As Winner of Oppenheimer Prize". Physics Today. 23 (3): 97. March 1970. Bibcode:1970PhT....23c..97.. doi:10.1063/1.3022048. ^ Dyson, Freeman (September 1998). Imagined Worlds. The Jerusalem-Harvard Lectures. HUP. p. 224. ISBN 9780674539099. ^ Steve Connor (23 March 2000). "£600,000 prize for physicist who urges ethics in science". The Independent. Retrieved 15 October 2015. ^ "Freeman Dyson: By the Book". The New York Times (Interview). 16 April 2015. ^ Dyson, Freeman (February 2009). "Birds and Frogs" (PDF). Notices of the American Mathematical Society. 56 (2): 212–223. ISSN 1088-9477. Archived (PDF) from the original on 2011-03-04. Retrieved 2015-04-23. Brower, Kenneth, 1978. The Starship and the Canoe, Holt, Rinehart and Winston. Schweber, Silvan S. (1994). QED and the Men Who Made It: Dyson, Feynman, Schwinger, and Tomonaga. Princeton University Press. ISBN 978-0-691-03327-3. Schewe, Phillip F., 2014. Maverick Genius: The Pioneering Odyssey of Freeman Dyson. St. Martin's Griffin: ISBN 978-1250042569. 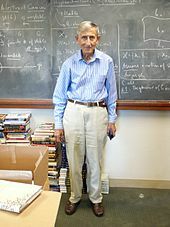 Wikimedia Commons has media related to Freeman Dyson. A radio interview with Freeman Dyson Aired on the Lewis Burke Frumkes Radio Show in 2009. Interview, 4 June 2009, Dyson comments on the misleading overemphasis of his climate-change views in the New York Times profile. Roberts, Russ (7 March 2011). "Dyson on Heresy, Climate Change, and Science". EconTalk. Library of Economics and Liberty.